A Publisher of Genre Fiction and New Pulp, Pro Se Productions proudly announces the debut of a new character, one whose roots are firmly planted in the early years of Comic books for inspiration. Author Richard C. White recalls the daring heroines of the Golden Age of adventure with his own character, springing to life in New Pulp prose. The Dark Leopard: Mouse Trap is now available in print and digital formats! Rachel Black is known to millions for many reasons—her hit movies, her glamorous lifestyle, and her reputed romances with Hollywood’s leading men. But Rachel also leads a secret life far away from the hot spotlights as the terror of criminals, saboteurs, and spies…because with the donning of a mask and risking of her life, Rachel is The Dark Leopard, Hollywood’s glamorous detective star. Rachel, her father, Langston Black, and Mark Stone, a journalist and some-time partner with the lovely masked heroine, are in Monaco to make a movie about Nancy Wake, the World War II’s most celebrated British Special Operations agent. It’s the chance of a lifetime for Rachel and she’ll do anything to make the picture successful. However, when things start going wrong on the set, she begins to wonder whether it’s a rival movie company or perhaps something more sinister—something that may call for a certain feline super-hero. Then, a shadow from the past makes Rachel remember the reason she became the Dark Leopard in the first place. Paying homage to classic Heroines of the Golden Age, Pro Se Productions proudly presents the debut adventures of The Dark Leopard, created by author Richard C. White. 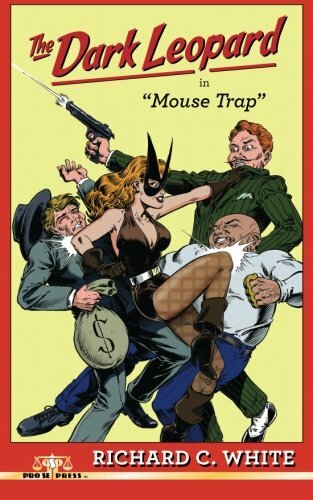 Featuring a stunning cover by Rock Baker and print formatting and logo design by Forrest Bryant, The Dark Leopard: Mouse Trap is available now at Amazon at http://www.amazon.com/Dark-Leopard-Mouse-Trap/dp/1514690764/ref=sr_1_1?ie=UTF8&qid=1435532079&sr=8-1&keywords=DARK+LEOPARd+mouse+trap and Pro Se’s own store at www.prose-press.com for 10.00. The debut of White’s catlike heroine is also available as an EBook, designed and formatted by Bryant for only $2.99 for the Kindle at http://www.amazon.com/Dark-Leopard-Mouse-Trap-ebook/dp/B010FY8VWY/ref=sr_1_1?ie=UTF8&qid=1435532406&sr=8-1&keywords=DARK+LEOPARd+mouse+trap+kindle and for most digital formats via Smashwords at http://www.smashwords.com/books/view/554071. ASIAN PULP DEBUTS FROM PRO SE PRODUCTIONS!